Portal and Minecraft have a history, with Valve's puzzler previously appearing in Mojang's creativity engine via a mod. 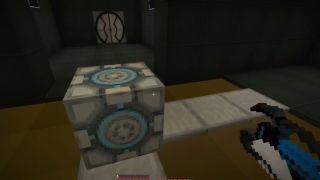 As a show of how far Minecraft's default creation tools have come, the above video shows a blocky version of Portal 2 that is playable without mods. Using just a regular map and texture pack, creator LagMaster163 has enabled portal and paint functionality, and created a sample set of levels to work as an early proof of concept. It's undeniably ropey at the moment; but the map is "still in beta". You can download it and try it for yourself here. By default, it's set to creative mode, letting other creators iterate and tinker with the design.